The centre of the village of Crawley is the main street which rises some half mile up hill from the pond at the bottom to the parish church of St Mary at the top. The site of the present church building has been occupied by a church for more than a thousand years. 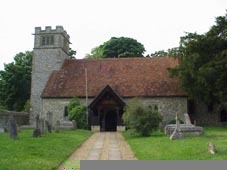 The earliest building was probably a timber Saxon church, followed by a Norman church using some stone of which small fragments survive and then in the 1380s, under the direction of William of Wykeham, Bishop of Winchester and Chancellor of England, a new church was built in the Early English style. Somewhat unusually the nave is built with four massive oak pillars supporting the roof like a farm barn. Further substantial building work took place in the late 16 century under a very active Archdeacon, a favourite of Elizabeth Tudor, who held the living and then in the late 19th century the chancel was completely refurbished under a Victorian rector and at his expense. The present building is therefore a 12th century foundation with extensive rebuilding in the 14th, 16th and 19th centuries. Finally at the end of the 20th century a church meeting room with kitchen and toilet facilities was built adjacent to the west end with entry from within and without the church. St Mary's now presents itself as a pretty and historic parish church able to serve its village community for Christian worship and use, traditional and modern, yet incorporating and displaying the inheritance of an English parish Church. This inheritance includes a list on the wall by the main door of all the Rectors of Crawley from 1324 to the present day; a hagioscope or squint through which in the middle ages the congregation in the nave could see the priest at the altar; an aumbry, a small recess in the wall in which the reserved sacrament may be safely kept; a 19th century organ of considerable quality which has recently been rebuilt and new ranks of pipes added; a very striking sculpture of the madonna and child in wood by the New Forest artist Ron Lane and a small tower with a ring of five bells, some dating from the early 18th century. St Mary's has much to show and the interior furnishings reflect the love for the church of the many generations of Crawley residents who have looked after the parish church. The churchyard in which the church stands has been closed for burials since the 1890s. Many gravestones still stand, the earliest from the start of the 18th century. Not far from the main door there is a large yew tree - the Hampshire weed - undoubtedly several hundred years old. The church building is placed close to the far boundary of the churchyard so that a visitor, making way up the main village street and looking to the right, can appreciate the simplicity, the elegance and the beauty of a small rural, yet historic, parish church. Price: £5. All proceeds go to St Mary's Church, Crawley.